Brad Maule and Rhonda Plymate Simmons, who charmed audiences with their performances last year in "August: Osage County," will perform together again in a benefit reading of A.R. Gurney's Pulitzer Prize-nominated play "Love Letters" at 7:30 p.m. Friday, Sept. 9, in W.M. Turner Auditorium on the SFA campus. NACOGDOCHES, Texas - Spontaneity will be at the heart of an upcoming performance by local acting favorites Brad Maule and Rhonda Plymate Simmons when they take the stage together again for the Stephen F. Austin State University Friends of Theatre upcoming fundraiser. Working together for the first time since the School of Theatre's production of "August: Osage County," Maule and Simmons will perform a staged reading of A.R. Gurney's "Love Letters" at 7:30 p.m. Friday, Sept. 9, in W.M. Turner Auditorium on the SFA campus. Proceeds from the event will provide scholarship opportunities for theatre students. "I don't get an opportunity to act that often on stage, so this is a wonderful thing for me," Maule said, "and it's great to work with Rhonda again." "Love Letters" is a play that depicts a life-long romance conducted almost entirely through the mail. The play is written to be performed as "reader's theatre" where two actors (a man and a woman) sit side by side with scripts open and perform the play with minimal movement. The relationship between the two characters begins with a simple thank-you note from one child to another and extends through several decades of successful, complicated lives lived mostly separately but always with an undercurrent of powerful connection between the two. 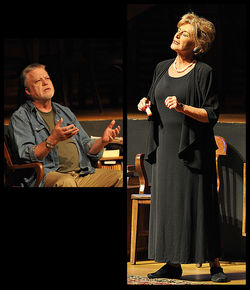 Last fall, a national tour of "Love Letters" featured "Love Story" stars Ali MacGraw and Ryan O'Neal. "I think we've all had unrequited love in our lives, and 'Love Letters' is a continuing lifetime of romance for two people," Maule said. "It's a little slice of the Hallmark channel," Simmons said. "It's a humorously bittersweet journey involving two people and their lifelong letters of communication." Doing the reading with only a couple of technical rehearsals, Maule likened this type of performance to "walking along the edge of a cliff." "I like that sort of 'acting danger,'" he said with a laugh. "It's fun." Maule said he hopes the audience gets a sense of the spontaneity involved in the production. "It's not over-rehearsed; in fact, it's not very rehearsed at all. It tends to take on the personalities of the people who are reading it, so we don't know what the outcome will be, and neither does the audience," he said. "Even though the words are already written, you never know where the sparks and the connections will happen." Because the reading is mounted without the costs of costuming and sets, those who attend get the satisfaction of knowing they personally contributed to the education of theatre students, Simmons said. "We wanted to do something low cost, so that every dime spent on tickets would allow audience members to feel like they were giving directly to students," she said. "We've done many different fundraisers, but we thought this might have a different appeal. A $50 contribution to scholarships is not a huge amount to ask of two people, especially if you enjoy the evening." Maule said there are no "financial motives" for himself or Simmons in committing to the performance, meaning "our intentions are in the right place." "It's not about ego or monetary gain," he said. "It's just a good, fun project, and therefore should be a good, fun evening." "We're two people charming an audience, hopefully, with a brief look into ourselves and our own relationships," Simmons said. "And, we're promoting the cultural enjoyment of theatre." Scott Shattuck, associate dean of the College of Fine Arts, is the director.